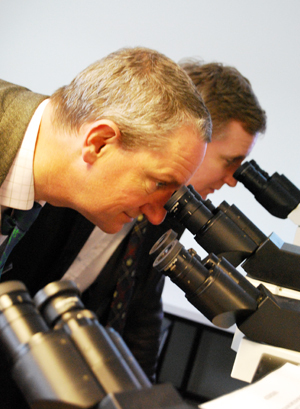 The RCVS undertakes formal visitations to UK veterinary schools to monitor the standard of approved degrees. The interval between visitations is normally seven years. If annual monitoring identifies concerns, a visitation may be brought forward or more frequent visits carried out. Visitations are carried out by a visiting team made up of five or six visitors who are led by a Chairman. The RCVS Education Committee appoints visitors on the recommendation of its Primary Qualifications Sub-Committee. Do you want to be considered as an RCVS visitor? The RCVS conducts visitations to UK veterinary schools approximately every eight years as part of its statutory duty to monitor the standard of veterinary undergraduate education. We are keen to expand our pool of possible visitors and invite members who have not previously taken part to be considered to join our visitations panels. Each visiting team is made up of five or six visitors covering veterinary basic sciences, paraclinical subjects, public health and food hygiene and large and small animal clinical studies. At least one member of the team must be in clinical practice. Applications are welcomed from RCVS members working in practice or in the universities. You will need to have at least seven years' professional experience, together with good knowledge and experience of current national veterinary standards in one of the above subject areas. You would work as a member of a team of experts to review and make recommendations to the RCVS on the standard of university training, following agreed RCVS and EAEVE criteria, and will need good problem solving skills, the ability to interpret large amounts of complex information, and good communication skills. Each visit lasts for up to a week and you would need to be able to devote time both before and afterwards for reading and preparing reports. We pay a loss of earnings allowance to employers for your time away from work. For further information, or to apply, please contact the Education Department, on 020 7202 0791 or email education@rcvs.org.uk.